A self-operated recording studio experience for the general public, using professional-grade voice-processors, headphones, microphones, and CD production technology in a sound resistant, automated, and Web-enabled recording booth. Walk into one of our state-of-the-art, multi-media recording booths, sing your heart out in privacy, record yourself with professional quality, and walk out with a beautifully produced CD of your performance. While you’re at it, e-mail your performance or send a Sing-A-Gram to friends, along with a video intro, post it on our website, even enter contests and win big prizes. Fully-automated, self-contained, freestanding vending unit approximately 6.6’ high by 3.5’ deep by 3.8’ wide. Customer self-operated system accessed by built-in computer touch screens with Audio/visual instructions. 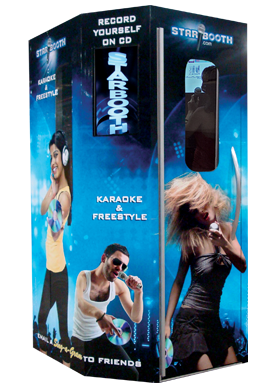 Enables customer recording from a huge library of popular karaoke songs, or their own lyrics to a variety of freestyle background music, rhythms and beats. Automatic cash and credit card-based payment system with real-time monitoring of sales data and revenue collections via a web-based account. Fully supported by real-time remote system monitoring, automatic self-reporting, self-resets, and remote customer support. Customize exteriors with logos, graphics and identity. Use video screens to feature special offers and messages. Self-brand CD labels.